When it comes to the new year it's almost refreshing to start thinking and dreaming of the year ahead. A whole 365 of brand new starts and new beginnings. With this, we were sent a Diary to design with our much loved Gel-A-Peel. 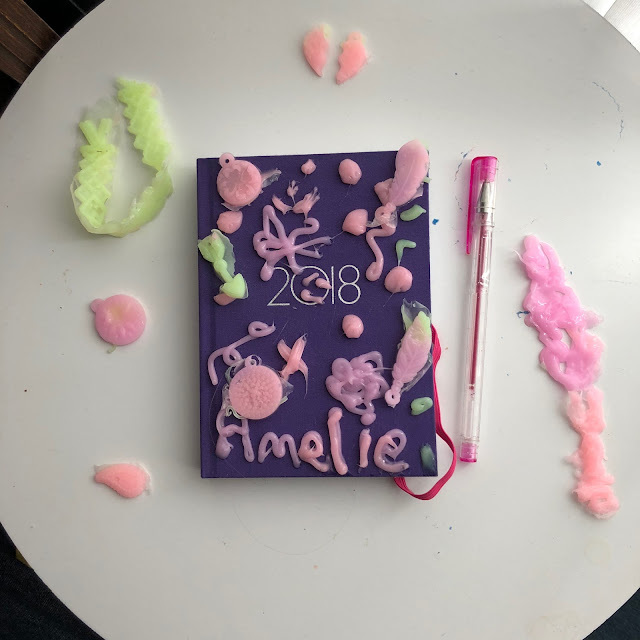 We have used Gel-A-Peel for multiple craft projects and there is nothing my children love more than decorating things. Gel-A-Peel is perfect for using for designing things as it comes with lots of different options. You can go wild and go free hand. You do need a steady hand though but perfect if you love creating little pretty things. The pack comes with 5 different Gel tips that can be used to create different effects from solid lines to star. The tips can be changed to different colours to create a blend effect colour. The Set that we were using comes with 16 different templates which can be moulded into different shapes. It's very easy to use and my children love using the mould. It's very easy to use and comes with a squeegee to scrape away excess gel. It's best to do the moulds the day before as they take some time to dry. Ami had great fun designing a Diary. She mainly went freehand and drew lots of flowers on the diary whilst Son Son used to moulds as he wanted to make a bracelet. All in all, we love using Gel-A-Peel it creates a wonderful texture to craft projects. Although don't get it on the table you will be cleaning for weeks. The Gel-A-Peel sets retail from £19.99 and now come in different colours and even glow in the dark which we are yet to try out.